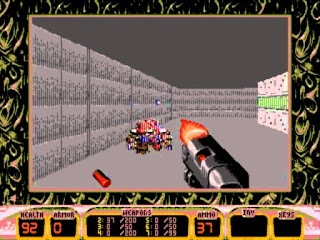 Duke Nukem 3D is a late-release first-person shooter that was only published in Brazil. Your job is to kill aliens and foil their plans to destroy Earth. This port contains a heavily modified version of the second episode called Lunar Apocalypse which consists of nine levels; the objective in each is to mow down enemies, collect key cards to unlock doors and then reach the exit. At your disposal is an extensive range of weapons including an RPG, Shotgun and Chain Gun. The huge levels are incredibly well designed, and the awe-inspiring graphics look better than Doom (1995, SNES) which needed an additional cartridge chip to pull off its 3D rendering. While the play field is cropped, it still takes up the majority of the screen, and I really like the amount of different texture mapping on display. For the most part, the action is speedy, but as the levels progress the frame-rate dips and slowdown occurs which can affect your aim. Speaking of which, the lack of a crosshair is a gigantic issue, as there's no visual aid to help you line-up shots. Ammo is weirdly scarce, and it's no fun having to run around like a madman for survival while awkwardly trying to kick aliens in the face! Even picking up weapons and ammo is annoying, as you need to be perfectly lined up for Duke to collect them. The main problem though is the difficulty level, as even on the Piece of Cake setting the enemy A.I. is extremely aggressive; in fact, each time you face an alien they'll shoot quicker than you can, and it's more uncommon to escape a battle unharmed than it is to take damage! It's almost as if your opponents know where you are at all times and the millisecond they spot you there's a bullet flying in your direction at high speed. Duke Nukem 3D is a technical masterpiece due to its spectacular graphics and impressive speed, and Tec Toy did an amazing job squeezing everything in without the need for additional chips. It's a real shame then that the gameplay was a mere afterthought, as the difficulty balance is way off, and there's too many quirks that ruin the fun. Random trivia: This Mega Drive port was re-released worldwide in 2015 by Piko Interactive.